Billy Sunday was the most famous evangelist of the late nineteenth century. A converted major league baseball player, Sunday captivated people by his wild antics. He stood on the pulpit, ran from one end of the platform to the other, and dove across the stage, pretending to slide into home plate. Sometimes he even smashed chairs to emphasize his points. His sermon notes had to be printed in large letters so that he could catch a glimpse of them as he raced by the pulpit. Sunday preached to more than one hundred million people and more than one million walked down the sawdust trail to receive Jesus (floors were covered with sawdust to dampen the noise of shuffling feet). Under Billy Graham, millions walked down the bleacher trail because most crusades were in sports stadiums. I’ve attended several Billy Graham stadium rallies and always wept when thousands responded to receive Jesus. Because of the long and cherished tradition of people like Sunday and Graham, many equate the winning of souls with the work of these gifted leaders. They equate evangelism with a gifted person who can attract a large crowd. Early Christianity, however, did not operate this way. The church of the first three centuries spread rapidly without the use of mass media, large public gatherings, or famous evangelists. The number of Christians multiplied through underground, decentralized house-to-house networks that spread friendship evangelism. In other words, everyone was an evangelist and intent on sharing the gospel to friends, neighbors, and work associates. Today, God is moving in this same way in countries like China, Ethiopia, and India. We met Kim and Kim Cole in the last chapter. They are not natural evangelists. They don’t preach in the open air or gather large crowds. They do, however, empower others and have multiplied their group seven times. Kim the wife, for example, developed a relationship with Crystal, her next-door neighbor, through intentionally borrowing a common cooking pot. Those in Kim’s neighborhood are from English and Irish descent and take great pride in their homes. Kim discovered that the best way to enter their worlds was to ask for help. As Crystal and Kim developed a natural friendship, Christ came into the conversation. Crystal peppered Kim with hard questions about the Christian faith and Kim had to depend on Jesus for the answers. More than anything, Crystal felt God’s love and friendship through Kim and eventually started attending the Cole’s Life group with her husband Todd. They began to feel part of a new family and eventually received Jesus. Crystal and Todd completed the church-wide equipping track and started leading their own Life group. They are now living the discipleship lifestyle that the Coles have exemplified repeatedly. The surprising conclusion from our research is that mobilized groups evangelize more effectively than depending on a gifted evangelist. 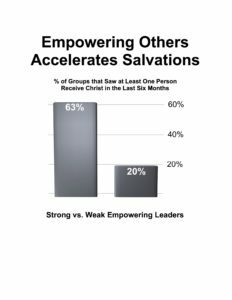 As the below chart shows, those groups who empower others are also the most fruitful in leading people to Jesus. Each person participates in reaching out to new people and makes them feel at home. There is a clear connection between empowerment and leading others to Christ. People rarely receive Jesus at the first opportunity to do so. They normally need to hear the gospel message on multiple occasions through various people. Thriving groups that empower people expect each member to reach out and make a difference, which increases the group’s effectiveness. People rarely receive Jesus at the first opportunity to do so. Groups that empower their members naturally attract more visitors. Because members are encouraged to invite their friends, more people actually come to the group. Helping members find their voice is what makes small groups thrive internally and externally. Groups that empower their members naturally attract more visitors. Thriving small groups, in other words, empower each member and see more people come to Christ and attract more visitors. The below chart shows the relationship between empowerment and visitors coming to the group. People invite others to “our” group much more than they do to “your” group. Why? Because there are multiple entry points in the group, rather than just one—the leader. Visitors build friendships with various people in the group, not just one person. Before they leave, they’ve been greeted and interacted with group members who have different gifts, talents, and personalities. Some connect better with quiet types, while others seek out the verbal, more sanguine personalities. When members feel needed and take ownership for the group, they naturally reach out to others. Members, not just leaders, know what visitors need and how to meet them. Newer members remember their own experiences and can understand the conflicting emotions that occur when entering the group for the first time. Members, not just leaders, know what visitors need and how to meet them. Vivian, for example, was the last person to leave the group’s Christmas outreach dinner because she wanted to talk with Carla, a first-time visitor. Vivian herself was a newcomer one year earlier and she knew what Carla felt like. She volunteered to wait at the front door for Carla in church on Sunday and then to sit with her and her husband George. When members feel empowered, they feel responsible to minister to visitors and follow-up as well. In Southern California, we have Disneyland, Knott’s Berry Farm, and Magic Mountain. I’ve lived in this area most of my life, and I’ve experienced many of the exciting rides in each of these parks—including some of the most exhilarating roller coasters in the world. The journey of the disciples with Jesus reminds me of a three-year roller coaster ride. They grew more like Jesus in the process, but it certainly wasn’t easy. The disciples went from fishing to following a miracle worker who opened blind eyes, multiplied loaves of bread, and raised the dead. Even though they heard the best teaching from the perfect teacher—the God-man—his teaching about his death and resurrection escaped them (Luke 9:45). When Jesus died on the cross, their roller coaster flew off the rails. It’s hard to imagine how horrendous it must have felt to them to watch him suffer. It even drove them to forsake Christ and flee. However, the ride wasn’t over. In three days, Jesus rose again. They could see with their own eyes that Jesus was alive and even a brutal Roman cross couldn’t keep him down. And then his teachings began to make sense. Now it was their turn to do radical things and turn the world upside down. Jesus told them to go into the entire world and make new disciples. They already knew what strategy to use because the Master had prepared them to go into homes, get to know the householder, watch for divine appointments, and then stay in the same home until all in the town or village had heard the Gospel message (Luke 9 & 10). They were empowered to live out what they learned from Christ. Then Pentecost happened and the power of the Holy Spirit fell upon them. They were empowered to live out what they learned from Christ. They proclaimed the good news, started multiplying house churches, and made disciples who made disciples. When persecuted, they blessed and prayed for their enemies. Through their love, words, and deeds, many new converts were effectively assimilated into the church. God still uses the formula of love and friendship to reach out to a hurting world today. One revealing small group icebreaker is “Who was most influential in bringing you to Christ?” Most likely you’ll hear responses like my brother, someone from work, a relative, teacher, and so forth. Only a small percentage will mention a stranger. Few people are brought to Christ by strangers. Those closest to us influenced us the most. 70-90 percent of people follow Jesus as a result of relational evangelism through close contacts. [ii] The most natural form of evangelism is the type that takes place through loving, caring relationships. Few non-Christians wake up one Sunday and decide to attend church. Those who do decide to attend a church service won’t normally stay unless they are connected to friends or family. The most natural form of evangelism is the type that takes place through loving, caring relationships. Examples of friendship evangelism abound in the Bible. In John 1:35-46, we read about Andrew’s relationship to Simon and Philip’s relationship to Nathanael. Lydia and the Philippian jailer both led their families to follow Christ (Acts 16:15; 16:31-33). Cornelius brought his fellow soldiers and family members to hear the Gospel (Acts 10:1-2, 22-24). And Matthew introduced his friends and fellow tax collectors to Christ (Matthew 9:10). Relationships are the bridges the Gospel travels to change lives. [iii] Effective group leaders proactively remind members to become friends with non-Christians and to develop those relationships. Greg Harris lives in Washington State. He was ready to commit suicide because his wife divorced him. He felt like a failure. On top of that, he was working day and night, trying to repay a debt from his wife’s custody agreement to support their children. He became very depressed. Then he was injured and began to drink heavily to relieve the pain. He decided it was time to end his life. Tim, a member of Eastside Alliance Church, saw Greg’s need, became his friend and encouraged him. Tim invited Greg to his group, where he eventually found the best friend of all—Jesus Christ. Tim personally invited Greg to the group because he knew the people would meet his needs and personally care for Greg. They did. The community of people in the group became a family to him and Greg was transformed. Jesus often met needs before discussing spiritual issues. In the book of John we are told that Jesus healed a paralytic (John 5:8) and only later called him to repent (verse 14). In John chapter 8, Jesus stands up for the woman caught in adultery (verse 7) and extends forgiveness to her, challenging her to change her lifestyle (verse 11). In John 9 Christ heals a man who had been born blind (verse 7) and sometime later invites the man to put his trust in Him (verse 35). These people opened up to Christ after He had shown them practical love and had let God display His power. In the same way, our witness to different people will begin in different ways. Like Jesus we should start at their point of need and continue from there to tell them about the Savior. Jesus often met needs before discussing spiritual issues. One important reason Yoido Full Gospel Church has become the largest church in the history of Christianity is because their groups pinpoint those with needs throughout Seoul, South Korea and increasingly throughout the world. God has placed your home in a strategic place and in a certain neighborhood. He’s given you specific friends. As you reach out to unbelievers, you’ll make an exciting discovery: The Holy Spirit has arrived ahead of you! He has given your friends and colleagues a hunger for Christ and has been preparing their hearts. Keep in mind that often you will be just one link in a chain of seed-sowers. Research shows that, on average, a person hears the Gospel seven times before responding to it. When you share your testimony or invite someone to a small group or church and they don’t respond to Christ, realize they might need more time. Because most people need to hear the Gospel several times, it’s important to provide different opportunities for them to hear the message. Like Jesus we should start at their point of need and continue from there to tell them about the Savior. As you look for signs of the Holy Spirit working in your friends’ lives, also notice the lives of those close to them. Many times a relative or friend of the person you are ministering to is close to responding to Christ. This person may be the key to unlocking the heart of your friend and many others in that network of relationships. Let God open your eyes to how He’s working in the lives you are touching. On average, a person hears the Gospel seven times before responding to it. I planted an inner-city church in Long Beach, California and pastored it for five years. Many in the congregation were African-Americans. One Sunday morning, I related a fictional story of an African-American lady on the west side of Long Beach who lived alone in her apartment. The landlord did not care about the tenants and allowed the building to decay. This poor widow did not have any heat in her apartment during the winter months. She decided to take the matter to court. Even though she knew nothing about the court system, she went ahead and filed a complaint anyway. Unfortunately, her case appeared before a prejudiced, atheistic judge. He thought that African-Americans should be put in their place. In fact, when she first appeared before him, he avoided eye contact while shuffling “more important” papers. However, she came back again and again. She refused to give up even though he became angry. Finally, he became so irritated that he granted her request. This story helped my congregation understand the meaning of Christ’s parable about the poor widow in Luke 18 who refused to accept the status quo. She, too, pled her case before an uncaring judge and won because she refused to accept her unjust situation. Effective groups and leaders are dedicated to prayer. As Christians, we can rebel against the status quo by persistently praying for our unsaved friends to be saved, for the unreached to hear the gospel, and for God’s righteousness to reign in the midst of injustice. Group outreach begins with group prayer. My own group has the discipline of putting empty chairs in the middle of the room and praying for those who will fill them. We expected God to answer quickly but it took a long time. Then someone received Jesus in our group, and we rejoiced that God indeed does answer prayer—in his own time. Often it takes longer than we expect because God doesn’t work on our schedule (2 Peter 3:8-9). Prayer will not only open the door for people to be saved but also prepares those in the group to reach out and remember those without Christ. As the group prays, God works in the hearts of the members to contact non-Christians, serve them, and invite them to the group. Some groups have created a “Blessing List,” which is simply a piece of paper with the names of unsaved people who are known to group members. Each member contributes one or two names. Then the group prays regularly for the names on the list. Often it takes longer than we expect because God doesn’t work on our schedule. The facilitator reminds the group members to bless and serve those on the list and to pray that God would work in their lives. As the group plans special outreach events, those on the list are the first to be notified. Prayer walking is another great way to reach out. Some groups regularly walk the neighborhood to pray for people who live nearby. I recommend walking in pairs through a specific community, praying for salvation to come to each home or apartment you walk past. · Pray for your non-Christian friends, family, and associates to come out of the darkness and into the light of Christ. · Pray for personal boldness so that you will not be intimidated. · Pray for protection, safety, and trust for the person. · Pray for receptivity when inviting the person to the group. · Pray fervently against any attack of the enemy on that person. · Pray for God to give them a hunger for Jesus Christ, to remove all barriers that keep them from responding to Christ, for God to bless each area of their lives, and for the Holy Spirit to make Jesus real to them. Michael Jordan was probably the greatest basketball player that ever played. Early in his career Jordan relied heavily on his own talent and efforts to win games. Yet, as he matured he focused on leading a team of winners. It paid off and the Chicago Bulls won the national championship year after year. Group evangelism is a team effort. The best leaders mobilize the group to work together to reach people for Christ. [ix] In Mark 1:17, Jesus tells his disciples whose trade was fishing, “I will make you fishers of men.” But fishing alone on the side of a river with a pole in hand definitely was not what Jesus and his fishermen friends had in mind. When they fished they did it as a team using nets. Their fishing involved multiple people and sometimes even multiple boats (John 21:6; Luke 5:6-7). Fishing with a net is far more effective than with a pole. Christ calls us to work together as we share the gospel message. The best leaders mobilize the group to work together to reach people for Christ. Non-Christians can see Christ in the life of a believer but can see Him even more clearly through the lives of a diverse and unified body of believers—the small group. God often attracts non-Christians as they see believers related to one another in love. Didn’t Jesus affirm this when he told his own group of disciples that by their love the world would believe (John 17:23)? Rotating homes among group members is an effective way to invite new people to the group. Non-Christians are more likely to attend a group when it’s in the house of their group member friend rather than a stranger’s home. One popular form of evangelism is called treasure hunting. The group prays together and asks Jesus to give pictures of people or places to evangelize. One might get a picture of a fountain; another a shopping center; someone else a person in a white shirt. The group then goes out to ask for prayer requests, share the good news of Jesus Christ, and meet needs. God answers prayer and sovereignly connects the prayers and visions with people and places along the way. o Worship and wait upon the Lord – Worship to connect with God and calm anxiety. After some songs, we will ask the Spirit to give us things to look for and then we write it down. For example: color (orange), name (Frank), item (umbrella and dog). Below is how that might play out. o Word of knowledge: Something specific we couldn’t have known. For example, last week on an outreach, some church members got the name “Julio.” Within an hour, they met Julio, and he and his son both got saved. o Healing – As we do outreach, we ask if they have pain we can pray for. This last week, some church members prayed for a guy with chronic knee pain, and after getting healed, he gave his life to Jesus! o Prophecy – God wants to speak unity over people (1 Cor. 14:3). o Highlight – As you go, the Spirit may cause someone to “stand out” to you. o Gospel – We always accompany God’s power with the actual preaching of the gospel, and then incorporating people into the life of the church. · Post-Outreach: Celebrate and debrief. My wife Celyce is great at inviting non-Christians to group outreach events. She uses crafts, holidays, and meals to attract non-Christians. Two neighbors eventually attended her Tuesday group, even though they didn’t respond right away. Celyce kept on praying and inviting. One of them received Jesus and started attending the Sunday celebration service. God often attracts non-Christians as they see believers related to one another in love. · Party Evangelism – Life Groups throw fun, clean parties in the homes or the city, and invite their friends. · Service Evangelism – Life Groups band together to serve a need in the community, looking for opportunities to serve alongside non-churched people (Matt 5:16). · Creative Evangelism – Mark 2 shows us a group that did whatever it took to get their friends to Jesus. Write down names, and think together and come with up creative ideas to do “whatever it takes” short of sinning to get people saved and connected. Jesus showed his disciples how to reach out, heal the sick, and minister to the broken hearted. He then sent them into homes to do the same. But he didn’t leave them alone. He debriefed them on their progress and empowered them to thrive. Christ’s band of followers changed the world and pointed the way for the rest of us to empower others. Empowering members in thriving groups can influence the course of history. Facilitators must not take on the entire evangelistic load. Rather, they should be like Jesus and empower each one to reach out and ultimately to make disciples of all the nations. How can your group be more effective in reaching unchurched people? Do you agree with the statement “Mobilized groups evangelize the best”? Why or why not? What can you do to help empower the group to more effectively reach out? [i] Joel Comiskey, Home Cell Group Explosion (Houston, TX: Touch Publications, 1998), p. 73. (sources: Wayne McDill’s Making Friends for Christ, Nashville, TN: Broadman Press, 1979, p. 28 & Jim Egli in Circle of Love). [iii] Random Acts of Kindness: Alton P. LaBorde Sr. writes: One of the key ways I’ve met and invited people to small groups is by helping people—strangers—who are in the process of moving. They may have a truck or a trailer loaded with furniture, and I just follow them to their destination and help them unload. On several occasions, I’ve used my truck and 16-foot-long trailer to assist them (Cell Church Magazine, Summer 1999, p. 13). [iv] Peggy Kannaday, ed. Church Growth and the Home Cell System (Seoul, Korea: Church Growth International, 1995), p.19. [v] Dale Galloway, 20-20 Vision, (Portland, OR: Scott Publishing, 1986) p. 144. [vi] What is an Oikos? The word oikos is found repeatedly in the New Testament, and is usually translated household. Today the word is used to refer to one’s primary group of friends—those who relate directly to us through family, work, recreation, hobbies, and neighbors. To give them a hunger for Christ. To remove all barriers keeping them from responding to Christ. For God’s blessing on each area of their lives. For the Holy Spirit to make Jesus real to them. The “empty chair” prayer – Leave one chair empty during each group meeting to represent one or more lost friends. Ask your group members to gather around the chair and pray for the salvation of the lost people in their oikos (sphere of influence). Prayer partners – Pair up group members who will pray daily for each other’s lost friends. These partners can hold each other accountable. Concert prayer for the lost – Introduce a new kind of prayer to your group! At your next meeting, ask them to stand and pray aloud simultaneously for the salvation of specific lost friends. It can be noisy, but it’s a powerful “rumble” of prayer that puts Satan on notice! Prayer walking – Walk in pairs through a targeted community, praying for salvation to come to each home or apartment you walk past. This is a great way to prepare a new host home for your group meetings. Create a “Blessing List” or “Most Wanted” Poster – Use a pre-printed poster or a piece of butcher paper and write the names of lost people on it. Post it on the wall and pray for these people each week, making plans to connect them to the members between meetings. [ix] Steps to Reach Out (I derived the basic steps from Janet Firebaugh’s article, “Fishing Together,” Small Group Dynamics (Small Group Network, October 1999). Each member targets one non-Christian contact (e.g., a family member, work associate, neighbor, etc.). Each group member commits himself (during the Works time) to initiate contact with that person within the next several weeks for the purpose of building their relationship. Invite these non-Christians into your life before inviting them to the group. Try to do things with them and serve them in the process. During eachmeeting (during the Works time), members share what happened with their contacts. The small group diligently prays for these people, as well as for the group member to continue to initiate contact. Pray that God will soften the hearts of the non-Christian friends. Ask Jesus to create opportunities for the building of friendships. Ask God to make it clear when the time is right to invite your friends to your group. A “harvest event” is scheduled for one month later. The idea is to plan a “neutral” group function—a dinner, a picnic, a women’s luncheon, pizza party, video, etc. A one-day retreat or social functions that include a short devotional may be ways to ease your friends into the spiritual aspects of the group. Members begin inviting their contacts to the harvest event. Make your harvest event seeker-sensitive. Go to great lengths to make everyone feel welcome. Sell the importance of group life by talking about the benefits of the group. You can always talk about the many benefits of the group to your own life. Re-invite your friend to the group when the opportunity arises. Through ongoing prayer and follow-up, many invitees continue attending the small group and eventually the worship service. [x] Cho quoted in Karen Hurston, Growing the World’s Largest Church (Springfield, MI: Chrism, 1994,) p. 107. Have the meeting at the home of the member who plans on inviting a new person. It’s much easier for a non-Christian person to enter a “friend’s home,” rather than attend a meeting in a stranger’s home. Hold an icebreaker night. This might include interactive group games. Show the Jesus video with the purpose of inviting non-Christians to attend. View parts of a secular video that lends itself to eternal questions. Plan a retreat with your group; go on a group bike ride; invite non-Christian friends to join the fun with you. Fill your empty chairs. Use some of the ideas above to invite new folks to your group. Look around on Sunday morning. Invite someone new or someone not in a group yet. [xii]The Matthew Cell: The Matthew Cell is a break in the regular cell cycle wherein full attention is given to the people in our lives who need Christ, or need to follow him more seriously. Setting apart special time to focus on the people in our oikos (sphere of influence) is essential to help your group members persevere with unbelievers in their lives. One important note: through you may have special periodic meetings, such as the Matthew Cell, that focus on outreach, never forego the weekly “share the vision” time in your small group, where you articulate the goal of the group to multiply disciples. We must be encouraged regularly to press on with our relationships.